The BS-110 is a powerful self-propelled machine, ideal for indoor and outdoor medium sized renovation jobs. This floor stripper is constructed of rugged metal for longevity and durability on the worksite. The BS-110 has a forward and backward function and is standard equipped with speed control. With mainly electronic components, this floor stripper requires almost no maintenance to keep running at peak performance. Blastrac has designed a full range of blades and chisels, which give the opportunity to process any floor and specific application. Both the push version and the ride-on version of our floor strippers are user friendly to operate and barely create any vibrations. All Blastrac floor strippers have a fast return on investment; machine components barely need replacing. 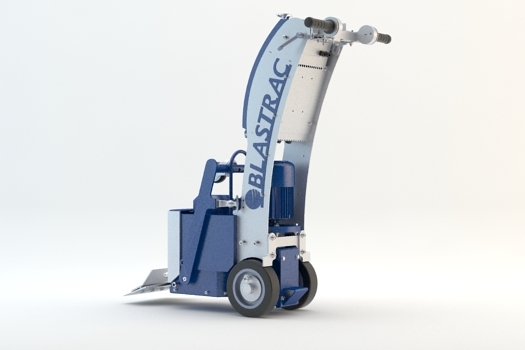 Blastrac strippers are heavy duty and strongly fabricated to create minimum downtime. All machines can easily pass through a standard doorway. Our floor strippers, like any other Blastrac machine, do not use any chemicals or waste valuable drinking water. Depending on the type of flooring material you would like to remove, you can chose from a wide range of blades or chisels. Ask us for advice! Application Hardwood parquet / ceramics / linoleum / vinyl / carpet / adhesives / glue / tiles / etc.